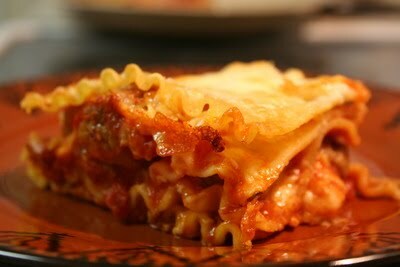 One of my all time favorite comfort foods is a good homemade lasagna. I'm not talking freezer-to-oven homemade, it's all about the day of labored love that goes into it. Honestly those no boil lasagna noodles suit me just fine, as long as it's layered with gooey cheesy-ness and a nice fresh tomato meat sauce. The thing I particularly love about lasagna is that it doesn't have to get all gussied up for me to love it time after time. I would never have done anything different with my go-to recipe...not until I opened up The Best International Recipe Book. I love this time of the year, when the mornings and nights are chillier and the leaves start to put on their show for us...how could you not love it. Another reason why I soak in as much autumn while I can get it is because of pumpkin. I don't know why (since you can get pumpkin year round thanks to Ms Libby) but a lot of us become obsessed with cooking with that beautiful orange pulp at about this time. I can't help but think Miss Bakerella agrees, and Mama of The Picky Palate really can't hide it (not even if you tried hunny!). So I decided to join in on the fun. I have to admit though, this recipe wasn't supposed to be what it is. It is the result of 2...TWO failed attempts at a recipe I had dreamt up. Oh well, when all else fails good old chocolate chip cookies come to the rescue. 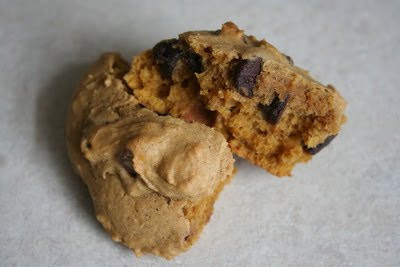 These cookies did come out a bit more cake-like than chewy cookie-like, but they were just as good really. The bottom line was that the pumpkin wasn't shy...it really showed through, and that's what we want right?! This is just a super simple, quick way to throw together something a little special for the season. I set out a plate just for Mother Nature herself and they were gone the next morning (but I suspect my visiting sister had something to do with that). Nothing says hello autumn better than a piping bowl of chili...or soup. Well I guess there are the falling leaves, dropping temperatures and shorter days, but chili shows it too. Seeing as how I like both chili and soup with equal adoration (ok I like soup better, but don't tell chili, promise?) I decided what would be better than to throw the two together. Wait, it gets even better, there's cheese! I know, it's great. I have this philosophy that anything involving tons of melty cheese has to be at least half good. So a recipe that calls for one and a half cups of cheddar gets a swift shove to the top of the to-cook pile (yea I really do have one). I guess the thing with it is that you actually have to look at it if you wanna knock it down a bit, which means enough magazine tear-outs and epicurious bookmarks - at least for a little while. This recipe, although towards the top of my list, has been neglected since February...I know, poor thing. With my chili-soup cravings this week I dug it out and tacked it on the no-more-excuses board (no I don't really have one of these, but sounds like a good idea...). I don't know why I waited so long to test out such a promising recipe. If you weren't hundreds of miles away you could've had one heck of a dinner (and dessert). I don't mean to toot my own horn, but this was delicious...actually I can't even take credit for the dinner. The credit goes to Aidells because they make a mean Italian style chicken sausage, yum. It has a bit of a bite to it so it went really well with my homemade marinara sauce and some spaghetti. It was a very hearty dinner, tasty too, but the real winner - the reason you're really going to wish you were here - is the banana bread. 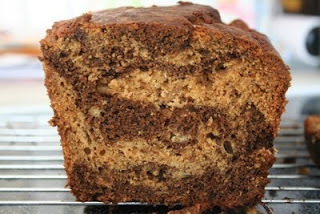 This banana bread is so delicious. I had three over-ripe bananas that someone was urging me to use as soon as physically possible, fearing they'd start multiplying into little rotten banana babies I'm sure. I was confident they were just fine, perfect in fact, for what I needed them for...just didn't know what that need was exactly. So I went to work trying to find something different from the usual banana dessert. I have tried a lot of different ways to bake with this fruit so any new suggestions are more than welcome! The recipe actually stumbled upon me, just at the perfect time which of course means it was meant to be. I opened up my daily Better Homes & Gardens e-mail packed with mouth-watering recipes. Taking a quick glance at the page my eye was immediately drawn to a recipe called "Two-Toned Banana Bread". Can I Cook An Aged Frozen Turkey? 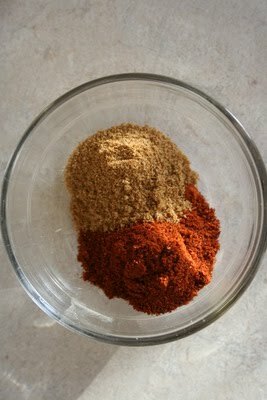 Can I cook a year old turkey? If you have an aged turkey that's been chilling in the back of the freezer for ohhhh, say a year now - it's ok, go ahead and cook the bird. In fact, according to ochef.com you can cook a turkey that's been lost in your freezer for up to four years. I wouldn't recommend dusting one off that's quite so old, but it's good news if that's all you're working with this year. Our turkey was forgotten in the back of the freezer for just over a year now...but in our deffense it wasn't our fault. Corporate must have scored a great deal on mark down turkeys last year because hubby's job gave him one after Thanksgiving...there's top level planning for yuh. We were grateful for the free bird but had little use for it after the big day, and we are not one to waste a poor soul that has passed away for our simple meat-eating enjoyment - so hold on to it we did. Ok, so now that you know you can eat the 15 pound ice chunk taking up space in the freezer you need to do some planning ahead. It takes several days to thaw a turkey in the fridge, which is the safest way to defrost of course. On average you want to plan for about 5 hours of thaw time per pound. Think of your 15 pounder...that's a lot of time, 75 hours in fact...3.125 days. With Thanksgiving just a week away make sure you clear the fridge for the chill-down zone. You'll want to place the turkey (in its original packaging) on a large platter or baking pan then put it in the refrigerator. Now you're prepared right? Yea me neither, but I'm getting there! Any more turkey day planning tips to offer? Don't be shy. Wayyyy back in 2006, Laura posted a recipe for Triple Chocolate Muffins. Apparently 3 1/2 yrs ago we were worlds behind in digital photography (got a flashback with the picture quality for a minute). Anyway, as recently as one month ago there was a comment posted to the recipe on how to create a heart attack muffin-pan-style with five varieties of chocolate. Although it passed my mind (very quickly) I figured it wouldn't hurt to try a quadruple chocolate muffin. Ok I haven't been totally honest here...I more than quickly thought about a quin-tuple choco recipe. The plan was to add a white chocolate ganache icing to this recipe, HOWEVER, after icing one cupcake I decided it was over-kill (yes it's possible with chocolate I assure you) the sweetness was unbearable. Plus, this chocolate cake recipe is so moist and so delicious I even found myself eating around all of those chocolate chips, I hope I'm not planting the seeds for a mutiny here but it's true. As a matter of fact, the next time I make this recipe it will just be a plain (imagine that) chocolate cake...mmmmm.